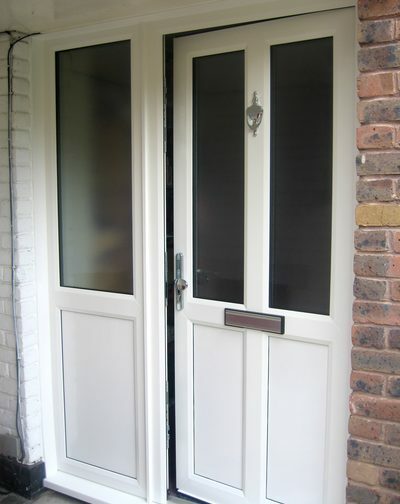 Learn about the pros and cons of upgrading an old single-glazed (front) door. Keeping heat in and drafts and noise out were big wins from our new front door, with no need to break the bank. In 2009 in our 40-year-old house the only single-glazed area was the front door and side-panel. The blanks were a single sheet of plywood, and so very weak from an insulation point of view. We had tackled these issues with a door curtain across the entire frame. We added a nylon-brush draught excluder on the letter-box, We also kept the corridor/hall behind the door mostly unheated using using a TRV (Thermostatic Radiator Valve) usually turned right down. In any case we'll be keeping the door curtain and the reduced hall temperature. And whatever new door we put in will have an built-in letterbox draught excluder. If you use a company registered with the Fenestration Self-Assessment Scheme (fensa.org.uk), they will get the necessary certificate of compliance. Building regulations also stipulate that all windows, except those in conservation areas and listed buildings, must have a certain thermal efficiency value (a "U value") to reduce heat loss. The lower the U value, the better. Single glazing is 5.5, while standard double-glazing is around 1.8. To really bring down the U value, it's worth getting double-glazing filled with argon gas. "It won't detract from the look of your windows," says Steve Hill. "But it can bring an 80 per cent increase in energy savings compared to single glazing, and a 45 per cent saving against ordinary double glazing." Nominally then, the first £250 of the install cost would be from our energy-efficiency budget. The remainder (the bulk of the money) would be from our 'redecoration' pot. In any case, my aim is to maximise the insulation (and minimise the U-value) since it makes relatively little difference to the final price. So part of our specification is for foam-filled panels, and warm-edge gas-filled double-glazed units. There is some argument about the thermal and environmental pros and cons of the various available materials for a new front door. Also on the impact on price and life and maintenance requirements. Sustainably-sourced (eg FSC) wood could be good environmentally and for disposal at end-of-life. But it may require more maintenance and deliver poor insulation performance. GRP (Glass-fibre Reinforced Plastic) can be prettier. But it doesn't seem vastly different to uPVC except in price. In the end we selected uPVC as the most economical solution (by ~30%). We didn't see very clear environmental reasons not to. We selected WarmLite's quote (£1235 inc VAT) for supply and installation of the new frame/door/panel (and removal of old), with Argon fill warm spacer bar glass elements to maximise thermal performance. The door was replaced in a few hours on the morning of 2009/07/20, efficiently and professionally. All gaps around the new door seem well sealed. But note that for the (double) door seal to be fully effective the multipoint locking needs to be enabled. It holds the door flat to the frame in several places. WarmLite took a £300 (cheque) deposit when we signed for the door. The balance was due by cheque on completion. At around the same time (and indeed completing by chance on the same day) we had the door from the living room refitted to help heat retention in winter. (It was not present when we moved in, and last winter we used a door curtain.) Along with the anticipated reduced draughts from the front door, I hope that comfort in the living room will be noticeably improved on cold and windy days, thus reducing heating demand too. The new livingroom door is just a simple cheap primed/unpainted wooden door (and handle) from a local DIY chain, purchased and fitted for £145 total. When we redecorate the rest of the room shortly, the door will get its lipstick! With the superinsulation of our living-room to a wall U-value of just over 0.2W/Km^2, I've been looking for some time to replace its leaky and creaky double glazing which the SAP calculations assume to have a U-value of about 2.7/Km^2. I've being trying to get sensible quotes from local and national suppliers for some time, struggling in part to explain that I don't care much about centre-pane U values, only overall performance. In both cases I wish to minimise whole-unit U-value, below 1W/Km^2 for the window and as good as we can get for the doors. We're currently white uPVC. As of 2010/08/28 the first quote to explicitly meet my spec has been from Rawington with the Uw values totalling under 1 across french doors and fixed window for an all-in price (eg including fitting and VAT) of a bit under £500/m^2. So congratulations to them for being the first to actually meet (and exceed) my specification explicitly. From Rawington I note a 20% performance penalty for the door compared to the fixed window, which seems reasonable to me. I'd hold other suppliers to something similar. In May we had Warmlite do an 'emergency' replacement of our main patio doors with Ug=1.0W/Km^2 with SolaGlas Climacontrol Vertical french doors. These seem sufficiently effective that, for example, on 2011/10/17 7am, while there was condensation inside the older adjacent doors there was condensation on the outside of the new Warmlite/SolaGlas doors. Energy Ratings - WER page including designs for Uw of 1.0W/m^2K. Pilkington Spacia(TM) vacuum glazing, 6mm rather than typical 24mm. FENSA, the FENestration Self-Assessment scheme professional body for windows/doors people. Double Glazing & Conservatory Ombudsman Scheme (DGCOS): "DGCOS is helping repair the industry's reputation and helps professional installers differentiate themselves from cowboys." Triple Glazing - Double Glazing: A Guide from Channel 4 in late 2009 including such useful nuggets as "... the centre pane U-values for efficient double-glazed units is 1.5--1.7, while for triple-glazed units it can be 0.8--1. The U-value for the frame has to be taken into account, but triple glazing could reduce the heat loss through the window by around a third," and "Triple glazing could cost 20-40% more than double glazing," and "For walls, the 'limiting' U-value would be 0.35, and the 'area weighted' U-value would be 0.7W/m^2K at worst." Green Building Forum thread on triple-glazing (3G) suppliers (and suggestion that 3G needs to be at least 36mm thick) including Russell, NorDan, http://www.fensterversand.com/, Rhyl Building Plastics. Photos of front door replacement. 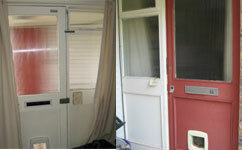 Photos of internal door replacement. First published 2009-06-07 , updated 2019-04-22 , rebuilt 2019-04-23 . Site copyright © 2007-2019 Damon Hart-Davis. Hosted by ExNet.